The Old Shop was built just south of the Information Centre and was a general store. In later life it was extended and became a residence. It suffered during several floods when water came about a metre up its walls. It stood vacant for some years when RADHA acquired it and had the extensions removed. It was relocated to the Information precinct by team of draft horses pulling a log slide. The Barn is a relatively new building it houses a collection of larger items including the Barney View Cream Truck, a bullock wagon that was used for carting logs, a spring cart and a huge table cut from a single length of log. Dulbolla and Glenapp Railway Sidings were removed from along the Queensland/New South Wales Railway Line when the trains no longer stopped there. The Glenapp Siding holds a very interesting model showing the mountains, rivers and locations in the area. 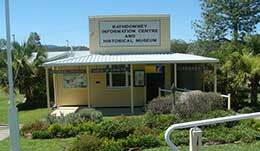 The Rathdowney Museum was opened in November 1984 and is housed in the Information Centre building. Volunteers from the surrounding districts have put our collection together. RADHA acquired Fred Johnson’s historic “Barney View Motor Service” cream truck and are very proud to have it home once again in Rathdowney. The 1937 international truck is still in working order and formed part of the grand parade at Rathdowney's Heritage Festivals.